The U.S. Army’s major Pacific-area exercise in 2020 will focus on China-based scenarios in the South and possibly East China Seas. The Commander of U.S. Army forces in the Pacific, General Robert Brown, explained the outlines of the 2020 Defender Pacific exercise at a conference in March. While the army focuses on partner-building throughout the Pacific, the high-end combat scenarios it prioritized have generally focused on a conflict on the Korean peninsula. 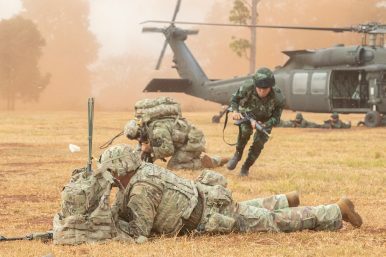 The exercise will deploy a division-sized force to the South China Sea to augment army forces already stationed forward in the Western Pacific and operate in traditional U.S. partner-nations like the Philippines and Thailand, but also may go to Malaysia, Indonesia, and Brunei. General Brown did not get into the specifics of the exercise, but the geography of the anticipated multinational participants and the U.S. Army’s renewed focus on projecting force across new domains, such as targeting ships to assist the U.S. Navy with sea control operations, suggests that part of the exercises may look at neutralizing China’s fleet and its militarized island bases. China’s bases in the Spratly Islands are about 200 nautical miles from parts of the Philippines, Brunei, and Malaysia. Indonesia and Malaysia are also host to critical maritime chokepoints that control access in and out of the South China Sea. The U.S. Army recently conducted a joint exercise with the U.S. Marine Corps practicing raiding and seizing a small island in Japan’s southwest Ryukyu chain, and another with Filipino troops as part of the Philippines-hosted Balikatan exercise. In addition to training to seize small Pacific Islands, the U.S. Army is investing in long-range missiles and cannon and rocket artillery capable against both stationary land targets and ships at sea. In last summer’s Rim of the Pacific exercise the army fired land-based artillery rockets and anti-ship cruise missiles against a target hulk for the first time. The army is also working on advanced new long-range guided artillery shells that could be adapted for use against maneuvering ships. By 2023, the U.S. Army expects to have an artillery battalion kitted with extended range cannon artillery systems. Prototype tests have already achieved ranges of seventy kilometers, with accuracy out to 62 kilometers, roughly twice the range of the army’s current 155-millimeter cannons. Ultimately the army wants to push the effective range of its 155 mm artillery to 120 kilometers or more. These extended range artillery systems are in addition to the army’s Strategic Long Range Cannon program that hopes to achieve accurate ranges up to 1,000 kilometers, and which the U.S. Secretary of the Army has already mused could be fielded in support of the U.S. Navy against Chinese warships and shore-based missiles.